Jan Kimpen is the Philips Chief Medical Officer, a position he has held since January 2016. As the leader for clinical strategy, medical affairs and health economics, Jan and his team work collaboratively to advance clinical capabilities and customer growth opportunities at Philips, including M&A. 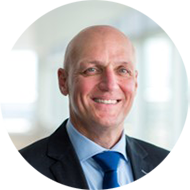 Jan also leads the Philips Medical Leadership Team at Philips – a team 800 clinicians and medical PhDs with responsibility for advocacy, customer partnerships, clinical trials and market access. A frequent speaker on value-based care and digital innovation in healthcare, Jan represents Philips on the Global Health Security Agenda private sector roundtable and the WEF Global Health Security Advisory Board. Jan joined the company from the University Medical Center Utrecht – one of the largest healthcare organizations in the Netherlands – where he was a professor and chairman of Pediatrics before serving as CEO from 2009 to 2015.